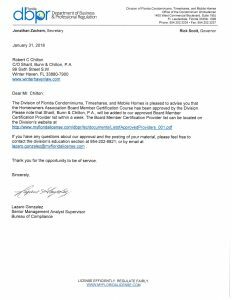 Chilton Certified as HOA Education Provider - Sharit, Bunn & Chilton, P.A. Sharit, Bunn & Chilton, P.A. On January 31, 2018, Robert Chilton and the firm of Sharit, Bunn & Chilton, P.A. 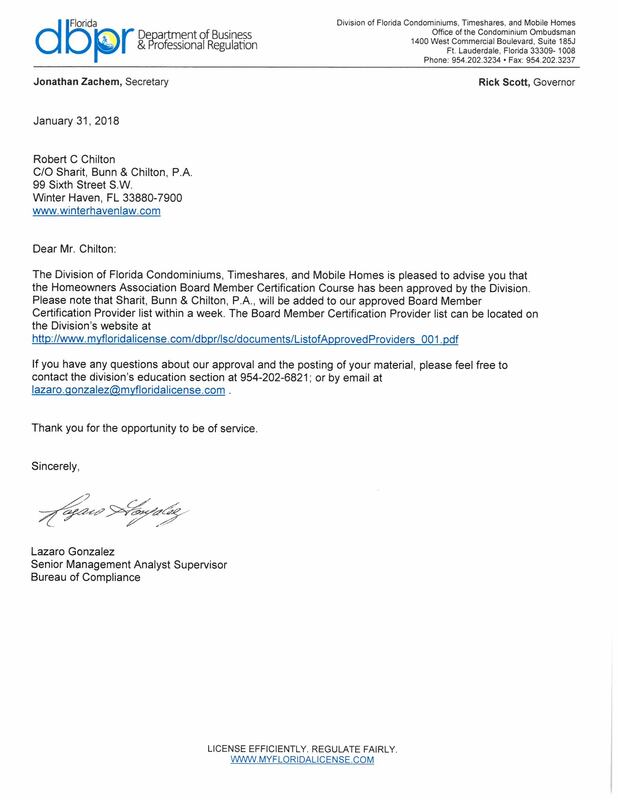 were approved by the Division of Florida Condominiums, Timeshares, and Mobile Homes, a division within Florida’s Department of Business and Professional Regulation as an HOA Board Member Certification Provider pursuant to Section 720.3033 of the Florida Homeowners’ Association Act. In the coming months, Mr. Chilton intends to host HOA seminars and certification courses throughout Polk County. Updates will be posted to this space.